Those who thought that it had all gone a bit quiet on the Adele front and were rather enjoying the respite from her warbling should be warned: she is about to make her first live performance in 12 months. Adele has been booked to sing the 'Skyfall' Bond theme at the Academy Awards on February 24. The song, co-written with her producer Paul Epworth, is nominated in the Best Original Song category. She has never song 'Skyfall' live before. "It's an honour to be nominated and terrifyingly wonderful to be singing in front of people who have captured my imagination over and over again," Adele said. "It's something I've never experienced and probably only ever will once!" Her last live performance was at the Brits Awards in February 2012, and she also sang at the Grammys. It seems that to catch an Adele show these days you need to be on the showbiz A list. 'Skyfall' is the first Bond theme to get an Oscar nomination since 'For Your Eyes Only' in 1981. It is facing competition from songs from Chasing Ice, Les Miserables, Life of Pi and Ted. 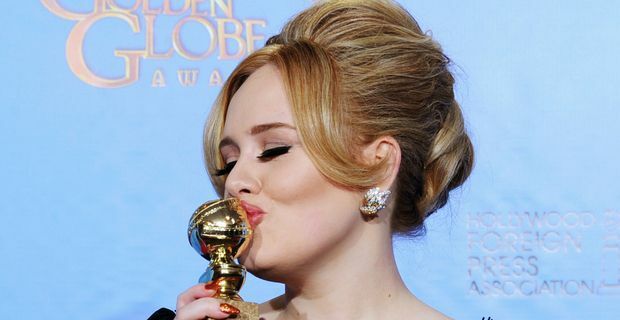 Adele has already had a taste of Hollywood when she picked up the Golden Globe award for the Bond theme. "It's very strange to be here," she said at the ceremony. "Thank you so much for letting me be a part of your world for a night, it's amazing." Her album 21 was the best-seller in the USA in 2012, as it was in 2011. It obviously doesn’t need any more promotion. Much of last year was taken up with family business as Adele gave birth to a son in October. Unconfirmed rumours suggest that she and fiancé Simon Konecki named the child Angelo. This is mainly based on the fact that Adele has been spotted wearing a gold necklace with the name.